Under the action of extreme intensities, either due to lasers or particle beams, the collective behavior of plasmas, and the nonlinearities in plasmas, play a critical role and determine the dynamics of a wide variety of complex laboratory and astrophysical scenarios. 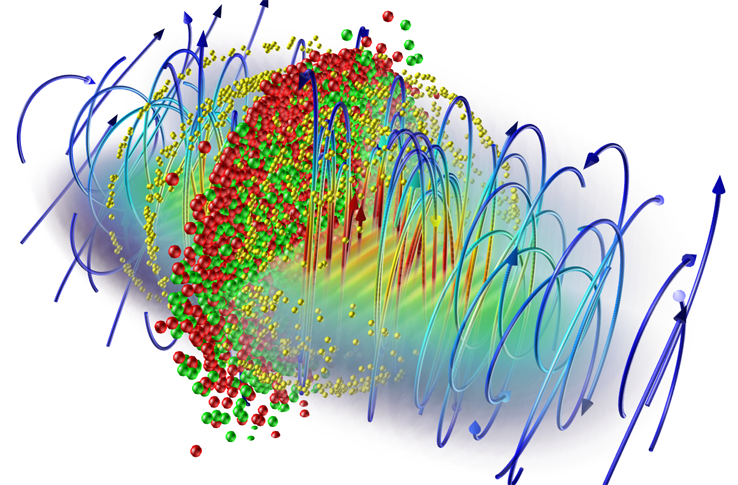 Relativistic kinetic theory provides the theoretical framework to describe these processes, and establishes a general description for the interaction of intense beams of charged particles, photons and neutrinos. However, the full nonlinear dynamics can only be explored with numerical simulations capable of capturing the kinetic features of plasmas and intense beam-plasma interactions. In our team we address some of the problems associated with extreme intensities in plasmas, with a combination of plasma theory and massively parallel numerical simulations with a focus on the particle-in-cell algorithm and its extensions (e.g. hybrid codes), and resorting to some of the largest supercomputers in the World – know more about our infrastructures here. How does matter behave in extreme electromagnetic fields, either at ultra-relativistic intensities, ultra-short timescales or at extremely hard wavelengths? Can one use plasma acceleration and other plasma-based techniques to develop compact accelerators for use at the energy frontier, in medicine, in probing materials, and in novel light sources for bioimaging? What are the mechanisms for particle acceleration in relativistic shocks and what can we learn about these cosmic accelerators in a laboratory experiment? Can advanced ignition concepts be used to develop inertial fusion energy? What are the enabling technologies to construct a laser with a peak power of over 1 Exawatt that would allow us to study matter subject to unprecedented forces? What are the conditions for the creation of pair plasmas in the laboratory under the action of ultra intense fields and what is the role of the self-consistent collective dynamics of such plasmas, in laboratory and in astrophysics? Can we tailor the properties of plasmas such that they exhibit exotic electromagnetic properties? Access a list of our team members' publications here. Know where we work and what tools we use here.